When Isabel meets Edward, both are at a crossroads: he wants to follow his late wife to the grave, and she is ready to give up on love. Thinking she is merely helping Edward’s daughter by agreeing to check in on her nonagenarian dad, Isabel has no idea that the man in the kitchen baking the sublime roast chicken and light-as-air apricot soufflé will end up changing her life. 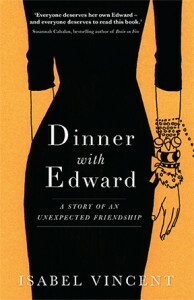 As Edward and Isabel meet weekly for the glorious dinners Edward prepares, he shares so much more than his recipes for apple galette, the perfect martini or tips for deboning poultry. Edward is teaching Isabel the luxury of slowing down and taking the time to think through everything she does, to deconstruct her own life, cutting it back to the bone and examining the guts, no matter how messy that proves to be. 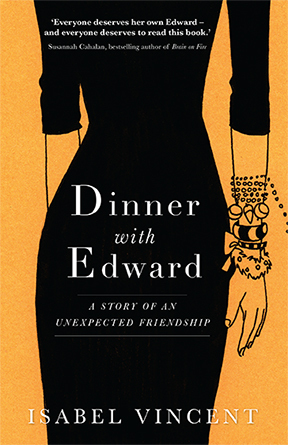 Dinner with Edward is a book about love and nourishment, sorrow and joy, and about how dinner with a friend can, in the words of M.F.K. Fisher, ‘sustain us against the hungers of the world’.